Oppdag Green Grotto Caves i Falmouth på denne 2,5-timers kysten ekskursjon. 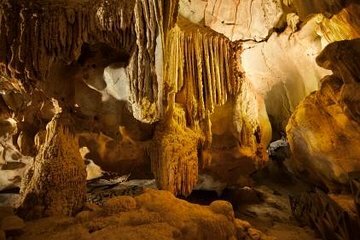 Lær om hulenes interessante rolle i Jamaica's historie fra din lokale guide mens du ser stalagmitter, stalaktitter og en uberørt underjordisk innsjø. Rundturstransport til Falmouths cruiseport er inkludert, og denne ekskursjonen er dekket av Viators bekymringsfrie utfluktspolitikk. Frastig deg cruiseskipet i Falmouths havn og møt din lokale guide. Styr ditt komfortable kjøretøy og reise til Jamaica's Green Grotto grotter nær Discovery Bay. Ved ankomst til grottehulene, merk de grønne alger som dekker veggene, og gi grotten sitt navn. Gå forbi mange forskjellige typer kalkstein bergformasjoner, inkludert et imponerende antall stalagmitter og stalaktitter. Se en uberørt krystallklar underjordisk innsjø som ligger dypt inne i hulen. Lær om hulenes interessante historie som en rømningsrute for det jamaicanske folket i det 17. århundre. Utforsk underjordiske huler på fritiden, og vær så snill å spørre din guide om eventuelle spørsmål. Når din 2,5-timers tur er over, vil du gå tilbake til Falmouth Cruise Port for drop-off. Vi vil sørge for din rettidig retur til Falmouth cruiseport etter denne aktiviteten. I det usannsynlige tilfelle at skipet ditt er avgang, vil vi ordne transport til din neste port-of-call. Hvis skipet ditt er forsinket ved ankomst og du savner denne aktiviteten, blir pengene dine refundert. Vennligst se Viators vilkår og betingelser for detaljer. The caves were amazing but our transportation was not the best. I'd check to make sure that you know who is taking you and picking you back up! I enjoyed the cave tour itself. The guide was friendly and funny too. The only thing I would mention is that the caves require a lot of steps and climbing. The 2.5 hour trip was actually a lot more because the bus was an hour late arriving at the meeting place. Also had to wait 45 minutes for the bus to return to take us back. Apparently the operator transports people to various other excursions which are not closeby. i didn't mind when the guide and bus driver asked if they could stop at Juicy patties for lunch because I was hungry for lunch myself. Unfortunately the fast food place does not take credit cards and does not make change in american dollars so i chose not to purchase anything. We were dropped off close to the ship but were too tired to shop. We loved our trip to the Green Grotto Caves. We booked this tour as an independent excursion while on a cruise. Our group consisted of my adult daughter, 9 year old granddaughter, and me, and we were joined by one other couple from the same cruise. Our driver Johnson was very friendly and informative. The guide at the Green Grotto Caves was enthusiastic and welcoming and took extra time to make the experience memorable and special for our 9 year old. I would recommend this excursion to anyone looking to explore a hidden side of Jamaica and learn more about the area's history. We booked this tour when we were at Port in Falmouth and wanted to do something other than go to the beach. The guide at Green Grotto Caves was very enthusiastic and knowledgeable. We enjoyed the tour however it seemed a little short. The excursion itself was listed for 2.5 hours and we were back at port in less than 2 hours. Our driver to and from the caves and was entertaining and shared his love of his homeland. Decent tour but not one of the best I've been on. Absolutely the only and last time I book a tour with VIATOR. The tour company contracted to do this tour never showed, and did not answer calls to their number. Not a way to earn repeat business. The guide assigned to our group at the Grotto was exceptional. He was very patient with all people on the tour some able to move quickly and some not so much. He shared much knowledge in a friendly and articulate way. The beauty of the caves is wonderful, and the history of its use fascinating. It is a tour not to be missed. Our driver was accommodating, and answered many of our questions, taking a more interesting route back to our ship. The only negative, our fault, was when we stopped for a traditional Jamaican lunch, albeit at a pretty place with lovely views and a nice breeze, the prices rivaled the highest price dinner cost in the states for lunch. We thought the menu was given in Jamaican dollars rather than US dollars. oops -- our fault for not thoroughly verifying. So easy to deal with. All the cruise ship excursions combined the caves with Dunn River Falls which we've done already, and just wanted to do the caves. It was super easy to find our driver once we got off the boat, he was very friendly and knowledgable about the island. He dropped us off at the caves, helped us get signed in, we got on the tour, he was waiting when we were done, and took us back to the ship. A perfect time for us, with none of the hassle. The caves were really cool too. The tour was about an hour long, and it was fun learning all the history. Our 6 year old really enjoyed this as well.